We have just published a new paper describing several sightings of blue whales off Angola during 2012, together with an assessment of the whaling data available for the country. More information is available on the African Journal of Marine Science website. 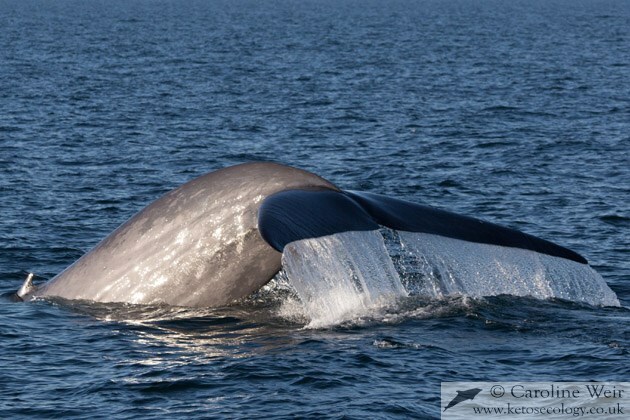 The population of blue whales Balaenoptera musculus inhabiting the south-east Atlantic (Gabon to South Africa) was heavily depleted by commercial whaling. We report four photographically-verified sightings, and one probable sighting, of blue whales in deep waters (>1,000 m) off central Angola (11°S to 12°30’S) during 2012. International Whaling Commission catch data from south-west Africa between 1908 and 1967 included an estimated 2,071 blue whales taken off Angola between 1909 and 1934. The highest combined catches (N=833) occurred at Elephant Bay (13°13’S), located just south of the recent sightings. Despite year-round survey effort the sightings had strong seasonality and occurred only between July and October. Whaling catches also peaked during July and August. The sightings included at least one cow-calf pair. Catches comprised a high proportion (63.3%) of immature animals and at least five Antarctic blue whale cow-calf pairs. Food (zooplankton) was present in 85% of captured individuals, indicating feeding in Angolan waters. Body lengths and seasonality indicate that at least some captured animals comprised the Antarctic blue whale B. m. intermedia subspecies. Further survey work is required to better clarify the status of blue whales in Angolan waters, particularly with regards to population structure and potential calving grounds.